Do you ever wish you could go back in time and offer your teenaged self some words of wisdom? With time and experience, we learn so much! 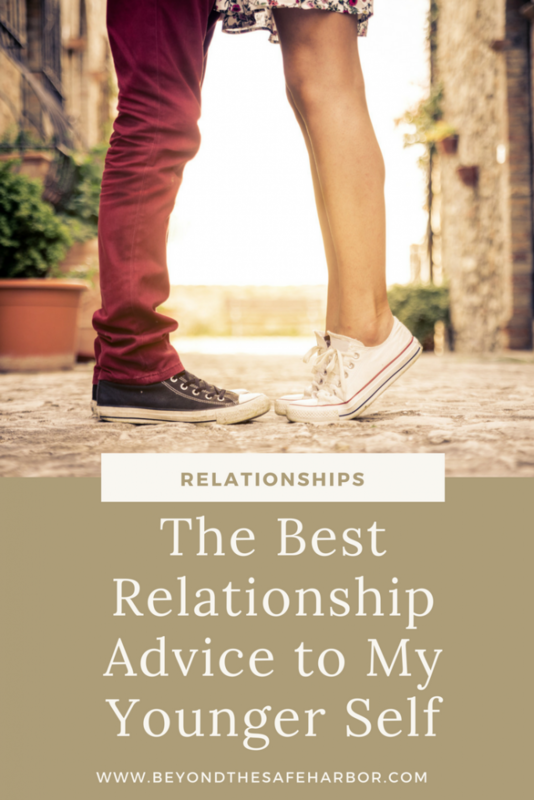 Here are 4 pieces of relationship advice to my younger self. If you’d rather see this in video form, you can watch it below! #1. Don’t lose yourself to a relationship. This one is so important! Make sure that you don’t lose sight of who you are, what matters to you, what you’re interested in, and the important people in your life. A great relationship doesn’t crowd out who you are. Instead, it celebrates those aspects and lets you be your true self. Besides, if the relationship ends, you want to be in a position of strength where you’re still a whole and fulfilled person, happy with yourself. If you rely to heavily on someone else and crowd out your own values and purpose, a breakup will be that much harder. #2. Cool off before voicing concerns. If you have something important to talk about, try to wait until the heat of the moment has passed. While it may be tempting to yell at your partner about something that’s upsetting you, that may not be the best approach. My advice would be to give yourself some time to cool off, reflect, and form your thoughts. Think through what you want to say, and then communicate in a clear, logical, and rational way. This will help you communicate your point of view in a way that is concrete, tangible, and free of emotion. And that will better enable your partner to understand what you’re saying. Don’t make a big deal out of every single small thing that might frustrate you. Instead, focus on the ones that are most important to you and/or issues that are part of a broader pattern or theme. Recognize that some of the issues that come up are driven by insecurity, a lack of confidence, or something totally different that has nothing to do with our partner. In those cases, reflect on what’s causing these feelings for you and be cautious about bringing them up. Instead of being a battle worth fighting, they may simply be a reflection of some work you need to do on yourself. In fact, my book The Confidence Toolkit goes into much more depth about how to build confidence based on scientifically proven methods. #4. Take the porch test. This may seem like a bizarre concept, but that’s because I made it up on my own! And I thought about it a lot when I was single. I focus on what type of love life I want, and where I want to be, and then try to visualize whether or not I could see the person that I’m dating in that situation. The porch test involves me imagining that I am 90 or 95 years old, sitting in a rocking chair on my front porch next to my husband. Our looks are gone. We’re no longer youthful and vibrant. But I want to make sure the person that I’m sitting next to is someone who I can still laugh with and someone who will still bring me a ton of joy and happiness. By focusing on your ultimate objective and trying to imagine whether the person that you’re with could really be that person makes it so much easier to really see whether that person is right for you in the long term. It’s very easy to get hung up on more surface-level things like what types of dates you go on and how strong the person is “on paper”. But those things probably won’t matter in the long term. So make sure that you visualize where you ultimately want to be and then make your decisions around you know who you think can be that person for you in the longer term. Leave me a comment below: what relationship advice do you have for your younger self?